c. 1880 photograph of four-year-old Charles Wadleigh Wilson; taken by the Y. 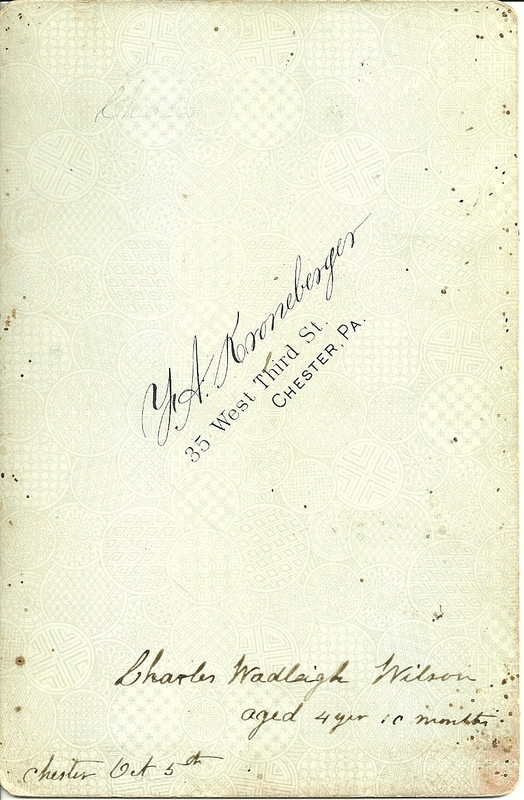 A. Kroneberger studio at 35 West Third Street, Chester, Pennsylvania. 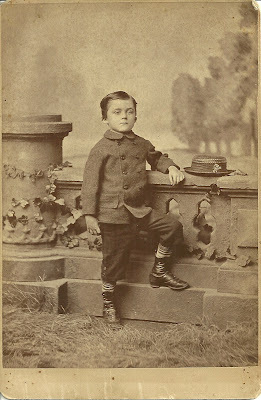 Charles Wadleigh Wilson was born 12 December 1876 at, I believe, Chester, Pennsylvania, the son of Joseph Osgood Wilson and wife Isabella (Cornog) Wilson. His paternal grandparents were Joseph and Ann T. (Osgood) Wilson, born in Delaware and Pennsylvania respectively. His maternal grandparents were Robert Gamble Cornog and Eleanor Jane (Harp) Cornog, both born in Philadelphia, Pennsylvania. JOSEPH OSGOOD WILSON, the master mechanic of the Arasapha Manufacturing Company, and a veteran of the civil war, was born November 27, 1843, at Dupont's Powder works, now known as Rockland, New Castle county, Delaware. His father, Joseph Wilson, was a native of England, who grew to manhood in that country, and after obtaining a good education, learned the business of cotton manufacturing, and married an English lady named Ann Mather, by whom he had one son, William, who still resides in England. Mrs. Wilson died about 1826, and through grief over that bereavement, Mr. Wilson determined to leave his native land and come to America. Arriving in this country he first settled at Pawtucket, Rhode Island, where he lived for a number of years. During this time he made the acquaintance and married Ann T. Osgood, a native of Massachusetts, whose father, Major Richard Osgood, was a commanding officer in the State militia, and took an active part in public affairs. About 1830 Mr. Wilson removed to Philadelphia, where there was greater demand for skilled labor, and entered the employ of Stephens & Son, cloth manufacturers of that city. Later he removed to Brandywine, and last of all to Chester, still connected with the business of Stephens & Son. He continued to reside in this city until his death in 1865, in the seventy-fifth year of his age. Politically he was an old line whig and a great admirer of Henry Clay. He was for years an active party worker,and an enthusiasticsupporterof American institutions, evincing an almost unbounded patriotism though so recently a citizen of England. In religion he was an Episcopalian, and was also a member of Washington Lodge, No. 2, Independent Order of Odd Fellows, of Philadelphia. Being a man of bright intellect and fine education, he took an active part in all local affairs, and was highly respected and loved by all who knew him, for his high moral qualities and unimpeachable integrity of character. By his marriage to Ann T. Osgood he had a family of eleven children, five sons and six daughters: Mary A. (1), deceased in infancy; Mary A. (2), became the wife of Daniel Scanlan; Sarah, married Samuel L. Scanlan, a brother of Daniel; Ruth, Emily, deceased in childhood: Richard (1), deceased in infancy; Richard (2), Eliza, Joseph O. (i), deceased in infancy: Joseph O. (2), the subject of this sketch: and John H. Mrs. Ann T. Wilson died March 12, 1892, on her eightythird birthday. ness. Being endowed with tact and ability, together with great energy of character, Mr. Wilson has profited by his wide experience, and has become one of the best engineers and machinists of this city. Politically Mr. Wilson is a republican, and an ardent supporter of the principles of his party. He is a member of Wilde Post, No. 25, Grand Army of the Republic, and of Providence avenue Methodist Episcopal church, in which latter he was one of the originators, and has long taken an active part, and is now treasurer of its board of trustees and a member of its board of stewards. On April 8, 1869, Joseph O. Wilson was united by marriage to Isabel Cornog, a daughter of Robert G. Cornog, formerly of Norristown, but now deceased, and a former resident of the city of Chester. To Mr. and Mrs. Wilson has been born a family of nine children, two sons and seven daughters: Sarah L.', Ellea nor J., Frank O., Charles W., Anna T., Mary P., Isabella, Josephine and Charlotte. Charles appears in the 1880 Census of Chester with parents and siblings. I also found his World War I draft enlistment card, showing that he was an unemployed laborer at Lompoc, California in September of 1918. I didn't find any other records for a Charles Wadleigh Wilson, and there's a plethora of Charles W. Wilsons born about the same time in Pennsylvania to throw me off track. If you have any corrections, additions or insights regarding the information presented here, please leave a comment or contact me directly. I'd especially like to know of Charles' later life.